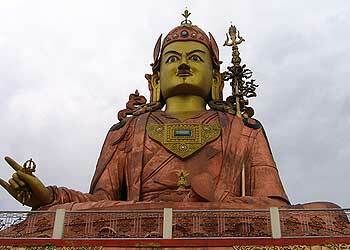 Namchi located in southern Sikkim is 78 km from the state capital of Gangtok. Nestled among he hills of Sikkim at an elevation of 5,500 feet, the word Namchi itself means sky high. It is getting a lot of attention of the tourists due to many tourist places to be visited nearby. 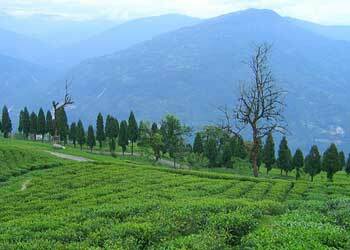 The one and only existing tea estate in the state that produces the top quality in the international market, the Temi tea estate is situated near Namchi. A visit to the tea garden along with the factory visit is quite educating experience. <br />The Menam hill is situated at the altitude of 10,300 feet. Not only the famous mountain ranges of the Kanchandzonga, but on a bright sunny day even the plains of Bengal are visible from this place. Indeed the scenic view from this place is unmatched from any other view in Sikkim. <br />The base of the Menam hill is the small township of Ravangala. It is a transit spot for trekkers going south and those who venture to the north of Sikkim. One of the holiest caves of Sikkim, the sacred cave of Shar Chok Bepchu is near to Ravangala and a trek to this place is a memorable experience. <br />The annual flower festival of Namchi is a major attraction during the summers.